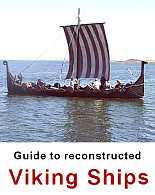 This is Viking Ship Museum’s own bid on a replica of one of the most frequently rebuilt wrecks. It was also the first larger reconstruction the museum in Roskilde made. Unlike most other Skuldelev 3-replicas, this one is full size and as close to the original as possible (i.e. handwoven, woolen sail). The Skuldelev 3 ship is a smaller ship which has been used for transport and trade in inner waters like Roskilde Fjord. Many other people has been inspired by the Skuldelev 3 ship exhibited in the Viking Ship Museum. 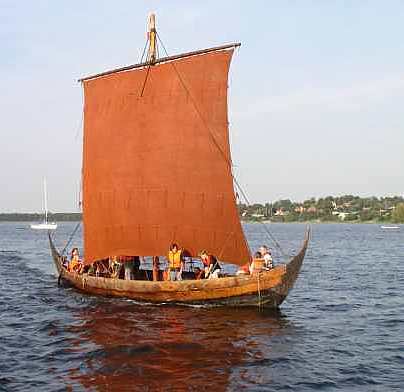 Even in Roskilde Fjord there are is another Skuldelev 3 reconstruction - Sif Ege. Terms of hiring: Renting is possible for groups as well as individuals for shorter trips. Courses in sailing square-sailed ships - contact the museum.